This is a favorite of mine. Since I’m am not a fan of peanut butter, i Know…not normal, I sub almond butter. 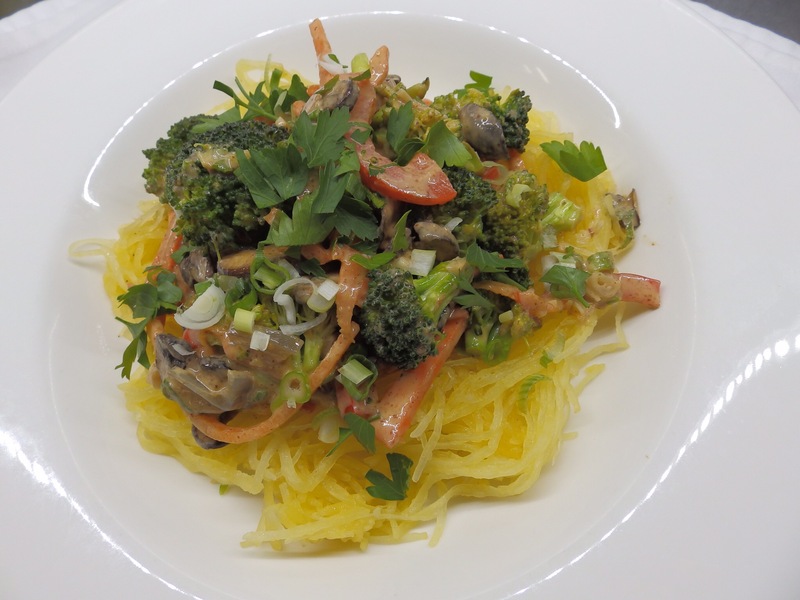 This dish can be served over regular pasta if you prefer but since I am Gluten Free Iuse Spaghetti Squash so pick which ever suits you better. There are gluten free noodles available now that are quite good and of course you can get 100% buckwheat noodles that are Gluten free, personally I’m not a fan and often I make enough of theirs to have for left overs and those noodles just dont hold well. Preheat oven to 375 degrees. Cut the squash in half length wise and remove seeds. Drizzle w/ olive oil and season w/ salt and pepper to taste. Place on a sheet pan, you can oil the sheet pan if you like, and roast for 35-40 minutes or until tender. Let cool a bit before using a fork to scrape the meat out of the skin. I like to cook mine the day before to spend up the cooking process the next day, and just reheat the flesh in a sauté pan when the sauce is ready to serve. 1. Mix together almond butter, tahini, water ,vinegar and tamari until smooth. Set aside for later. 2. In a medium hot sauté pan and sesame oil. Add mushrooms and sauté until browned a bit. Toss in broccoli, carrots and bell pepper. Sauté about 4 minutes. 3. Add shallots, garlic and ginger. Sauté another 3-4 minutes. If veggies are looking a little dry you can add 1-2 Tbs of water to continue to sauté. 4. Reduce heat to low. After about 1 minute add scallions and sauce mixture. Stor well and simmer until thickened- about 2-3 minutes. 5. If spaghetti squash was cooked early enough to be chilled then in a separate pan heat a little olive oil and sauté to reheat. Divide squash onto 2 plates if serving as an entree creating a small well in the center. Divide the veggies and sauce onto the two plates and garnish with the cilantro. *Spice it up a bit with a little hot sauce like Siracha over the top.